This is the fourth of four stories about my dealing with police while hitchhiking from 1968 to 1971. When I lit out hitchhiking from Princeton, New Jersey, toward New England in the spring of 1969 my objective was to avoid traffic. It seemed best to head to the north and pass well out of reach of the biggest traffic snarl of all: New York City. So it was I found myself heading toward my fourth encounter between an Officer of the Law and a rumpled highway hippie. Checking out a map I noticed a large green area well above the city, marked as the Catskill Mountains. Vague references to the Catskills swam somewhere in my memory but the real attraction on the map was the lack of towns in this large area. Plus, there was one very little black line jagging through it. I checked and sure enough, that little black line was the smallest road this map bothered to indicate. Tiny letters labeled it Frost Valley. 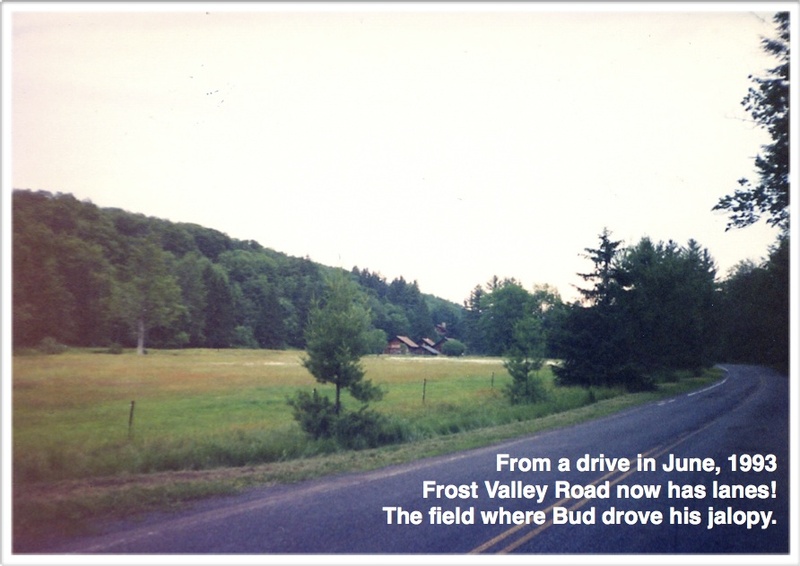 It was April, I was cold, and one would think an area called Frost Valley would sound better in the heat of summer. But I could not resist that little black line on a map. I loved it as soon as I stepped onto the Frost Valley road. What was a little black line on the map was simply a little black line on the ground. There were no painted lines. 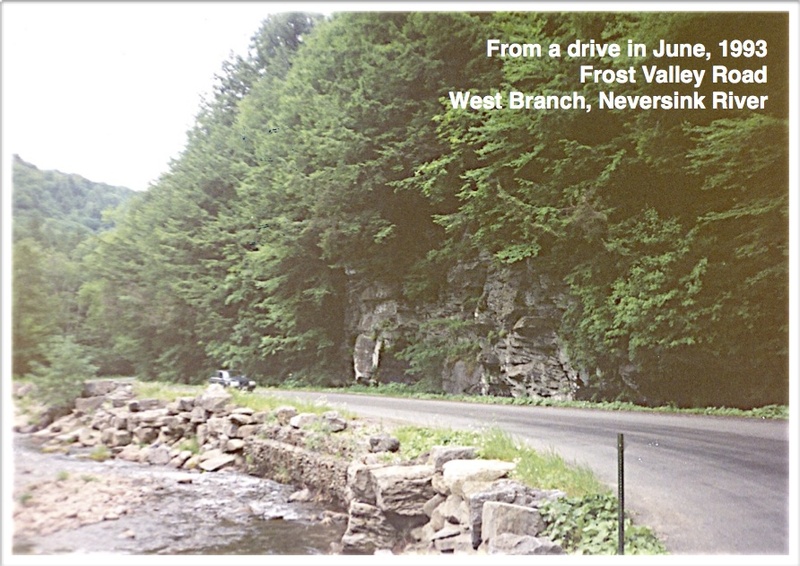 Whenever a tree was in the way or a rock outcropping got close the road just narrowed itself around them. In the West this would have been an unimproved dirt road, but New York is more populated than Idaho and here the road was coated with what I learned was called grader mix—a process where gravel is piled down the middle of the road, thick tar is mixed into with a road grader pushing the combination back and forth across the road, and the mixture is then flattened across the road and rolled into a macadam surface. 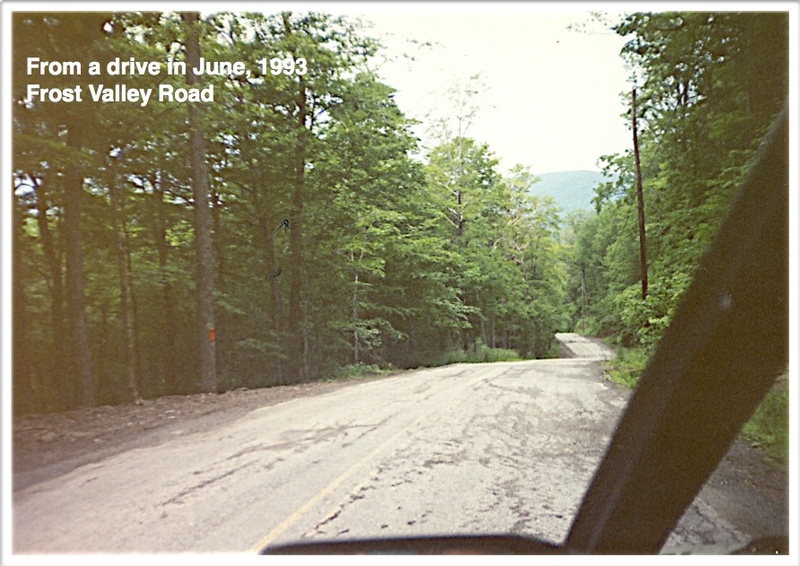 It was heaven—spring hardwood trees and shrubs, just leafing out, crowding up to and pushing over the road. Ferns coating the ground under the canopy of the forest. Small waterfalls splashing down an occasional steep hillside beside the road. A clear mountain brook gurgling and babbling beside it all. It was all new to me, being from the dry pine forests of the West. Also new to me were the Private Property — No Trespassing signs. Idaho is 60% owned by We the People of the United States. I was not familiar with every fourth tree having a paper warning sign on it. What was this having to stay on the narrow strip of land between Private Property signs and the edge of the roadway? But stay there I did! Far be it from me to attract the dangerous, hippie-hatin’ cops. I was several miles into the Frost Valley road and the light was starting to fade when a large Suburban filled with kids passed by. A minute later I came upon a wide spot in the valley with several buildings set back from the road, a mown field separating us. A spunky kid must have gotten out of the Suburban and just made it across the mown field, where I saw him drop his books and jump on a jalopy that was little more than a motorized frame. He drove the contraption right to me. He could not have been more enthused to meet a real genuine hitch hiker. I couldn’t help but really like this sparkle-eyed smiling bundle of enthusiasm. The kid mentioned his dad might need some help with spring cleaning and I decided perhaps I’d go back a hundred yards or so and find a place to sleep. A place where the tree holding the Private Property sign was far enough off the road so I could wedge myself between trespassing and sleeping in the road. The next morning I heard the Suburban pass, a load of kids headed to class. I rustled myself and brushed my teeth in the water running beside the road. I finished off my last half a can of beans. My toothbrush was tucked in my pocket and I was just getting the rope cinched around my sleeping bag, all dallying enough so the kid’s dad might have a chance to come find me. Then I heard the Suburban headed back up the valley. I looked up as it slowed to a stop. In the right hand front window I saw the sign, CONSTABLE. The dangerous cop got out with a grin on his face. His son had told him about me and he’d been glad to see me camping beside the road that morning. And sure enough he could use some help since the hired hand from the last several years had moved away. Would sleeping in the den, eating with the family, and a buck fifty an hour be OK for a few weeks of spring cleaning? This entry was posted in Hitchhiking on September 13, 2013 by deansgreatwahoo.